King Arthur Best Birthday Cupcakes are tender, vanilla cake cupcakes piped with luscious chocolate buttercream. Sprinkles or not, they’re hands down the best birthday cupcakes ever. Hint: they disappear FAST! This is King Arthur’s signature recipe of the year for 2019. If you’re unfamiliar with King Arthur, they’re pretty much the baking authority in New England, IMHO. Their test kitchens and quality baking supplies and ingredients create the best quality baked goods. That’s why these cupcakes are THE best! In March my extended family gathered at a restaurant in Massachusetts to celebrate my dad’s #80! Sweet times. I made these cupcakes for the first time and brought them along. Cupcakes Are Easier to Bake than Cake! For me, cupcakes are simpler to make than a birthday cake and much easier to travel with. 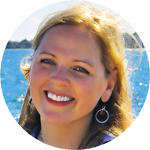 There is no struggle centering names or sentiments in frosting or any intricate decorating to worry about. 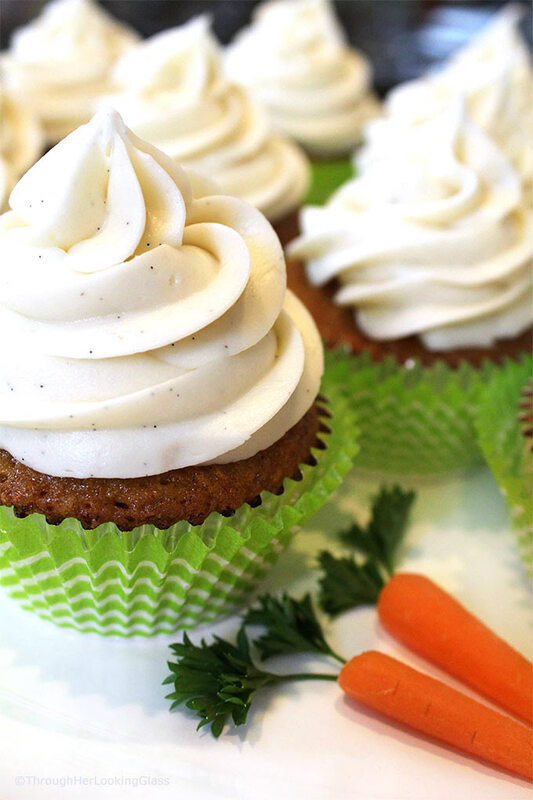 With cupcakes, there are no cake layers to level or fillings to prepare. And best of all, no need to cut perfect cake slices! Cupcakes are the perfect self-contained little party. A big frosting swirl, candles and a few sprinkles make them extra special. Stack them on a tiered stand and now you’ve got a little drama! This weekend is my Hudson’s 9th birthday. Every birthday for Hudson is just a little bittersweet. Hudson has Down syndrome and autism and is about two years old developmentally. He’s also non-verbal. His favorite day of the year is definitely his birthday. It’s not about the cake or presents, he doesn’t care about either. It’s all about the happy birthday song and blowing out his candles. This year I’m making him these special Birthday Cupcakes. The truth is, he has a lot of sensory issues that include food. So while he may not even taste one, we’ll be more than happy to help him out! Mostly he’ll relish blowing out every last candle on all 28 cupcakes. And we’ll be cheering him on. This recipe makes 28 cupcakes. Don’t try to make it into 24 like I did the first time. These cupcakes bake flat, and excess batter spills over, rather than rising higher. 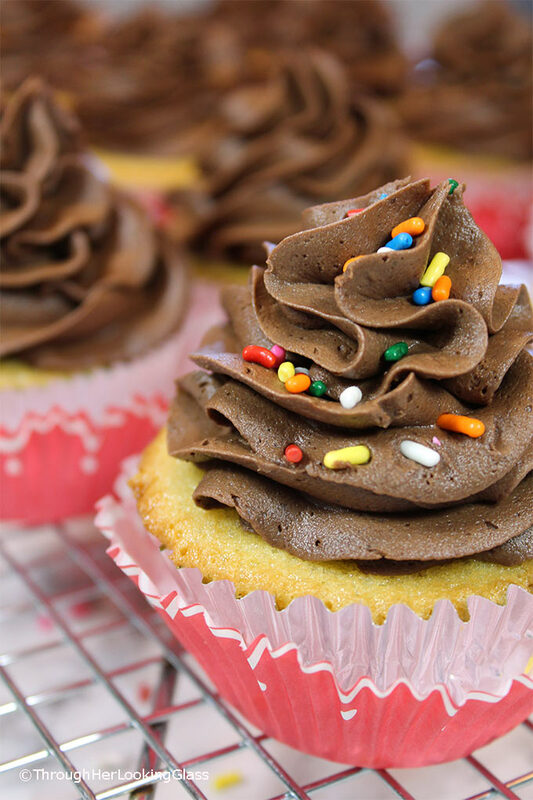 Use a scant quarter cup batter for each cupcake. Stagger baking in your oven to bake these evenly. (Bake cupcake pans one at a time , rather than simultaneously on different oven racks.) Or lucky you if you have a double oven. Since you’re baking this recipe into 28 cupcakes, you’ll have a baking pan with some empty cupcake holes. For even heating of the pan and even baking, fill empty cupcake pan holes with about an inch of water. 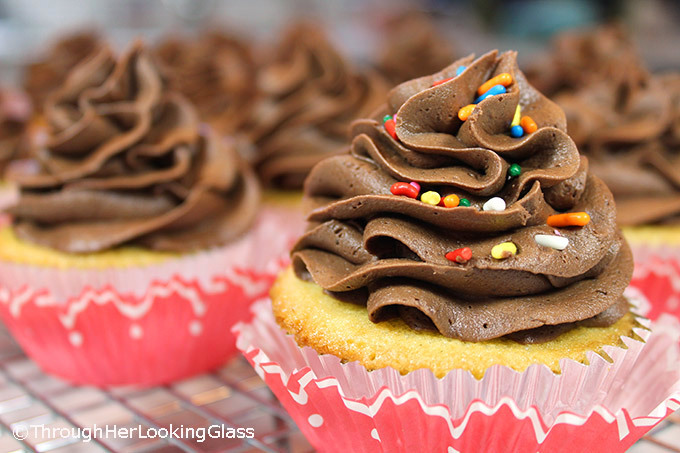 To keep cupcake wrappers bright, bake in foil cupcake papers first, then add a pretty cupcake paper liner after baking when cupcakes are cool. Find more tips for baking these amazing King Arthur Best Birthday Cupcakes here. Other cupcake recipes you may enjoy: Funfetti Birthday Cupcakes, Red Velvet Birthday Cupcakes, and Small Batch Vanilla Cupcakes. Preheat oven to 325°. Baking rack should be in the center of the oven. Line cupcake pans with 28 cupcake liners, foil is preferred. Spoon flour loosely into measuring cup and level off. In a small bowl, combine flour, salt and baking powder. Set aside. In a large mixing bowl or electric stand mixer bowl, beat eggs, sugar, vanilla and almond extract. Beat batter until thickened and golden in color, for about two minutes at medium high speed with whisk attachment. If you don't have a whisk attachment, beat with paddle mixer attachment or electric hand mixer on medium high for about 5 minutes. Scrape down bottom and sides of bowl and mix again quickly until all is combined. Batter should be thick and yellow and fall in ribbons from the beaters. Add dry ingredients to the batter and fold in by hand or on low mixer speed until just combined. Scrape down bottom and sides and mix again until just combined. Set aside. In a small saucepan over medium heat, bring milk to a simmer. Remove milk from heat and gently stir in butter pieces and vegetable oil, until butter is fully melted. Slowly stir hot milk mixture into cake batter by hand or using low speed on an electric mixer. Scrape down bowl sides and bottom and mix again just to combine. Fill any empty cupcake pan holes with 1 " water to facilitate even baking/pan temperature. For most even baking, bake one pan at a time. 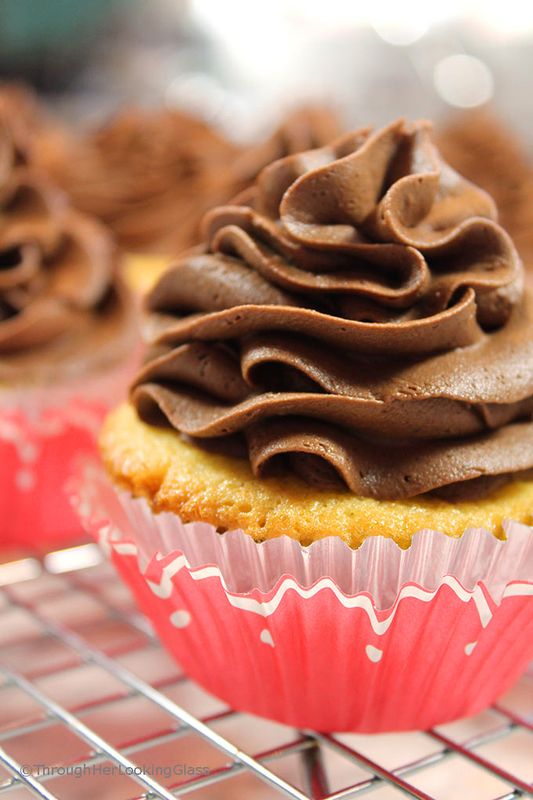 Cupcakes will start to brown on the edges when they are ready. Remove from oven and place on wire racks to cool. 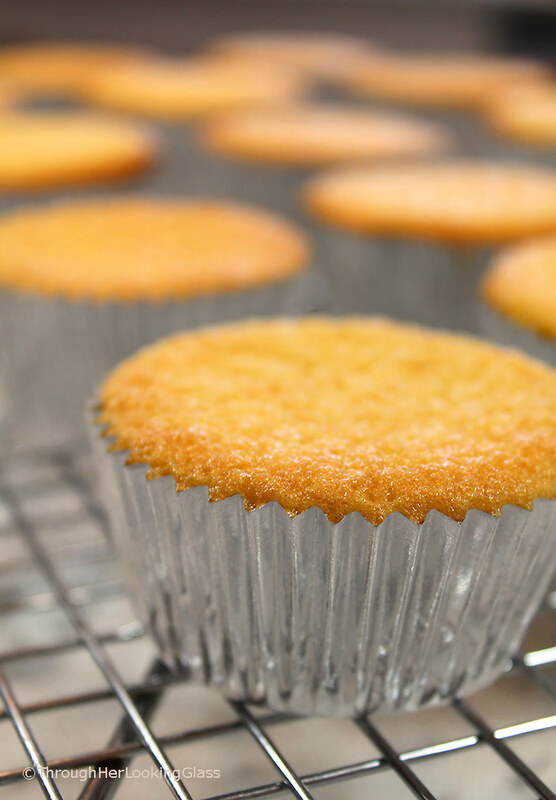 While still hot, gently loosen cupcakes edges from pan with a sharp knife if needed. In large mixing bowl or stand mixer, stir together sifted cocoa powder, 1 1/2 cups powdered sugar and salt. Stir in hot water and vanilla, scraping bowl afterwards. Add butter and remaining powdered sugar. Using an electric hand mixer or stand mixer with paddle, beat frosting at medium high speed for 1-2 minutes, stopping halfway through beating to scrape down bottom and sides of bowl. If frosting is the right consistency, decorate cupcakes. If too thick or stiff, beat in more hot water, a teaspoon at a time. If frosting is too thin, beat in more powdered sugar, 1/4 cup at a time. If you say they are the best I believe you!! Cam loves the cupcakes they have on the Cape. He says they are the best. I’ll have to bake some for him and show off!! Happy Birthday to Hudson!! I love how you will put a candle on each cupcake for him to blow out. He will love it!! I love vanilla cake with chocolate frosting. I also love your suggestion about the foil cupcake liner with the paper one on the outside, and so glad you recommended the 28 cupcakes. With other recipes I would either overfill 24 or feel very guilty about dumping out cake batter--what a crime! My mom is turning 80 this year, too. :) Give Hudson a big birthday hug from the Mandels!